The Medical City (TMC), a tertiary care hospital in the Philippines, has deployed a location-enabled, real-time hand hygiene compliance tracking solution to ensure the safety of all its patients and staff members. The real-time hospital measurement system combines Excelion Technology’s Accreditrack software and CenTrak’s real-time location system to measure hand hygiene compliance while adhering to guidelines established by the World Health Organization (WHO). TMC adherence to WHO protocols can now be tracked, aggregated and displayed in real-time through the Accreditrack software suite. 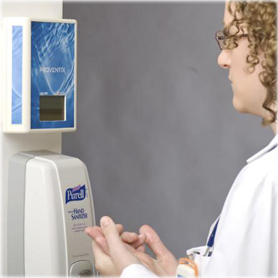 Hand hygiene events are measured using CenTrak’s Second Generation Infrared (Gen2IR) tags worn by caregivers, and the information is relayed wirelessly to the Accreditrack system for real-time analysis. If a caregiver misses a hand hygiene opportunity, the caregiver is immediately reminded by an audible alert on their tag. To ensure successful and sustainable cultural change, Excelion also implemented Lean Healthcare methodology to map and transform TMC’s hand hygiene compliance procedures for improved outcomes. As a result of deploying the system, hospital acquired infections in The Medical City’s intensive-care unit have decreased by 48% compared to the same period the previous year. Furthermore, TMC has experienced reductions to average length of patient stay.